Why do cocktails exist? There’s so many answers to the question, just like asking why does cooking exist, but, like most things, cocktails began somewhere, and that somewhere was a place few would tread. Drink in America before prohibition was a dark and dreary place. The awful and dangerous state of some venues where alcohol was served, and the questionable characters of both patron and proprietor are detailed most notably by Gary Regan in The Joy of Mixology, and distilling, in general, fared no better. For all intent and purpose, America consumed more booze than one would conceive, and the booze they consumed was in some cases barely palatable, and in other cases poison. Something had to be done, at least with the spirits that weren’t poisonous, and some of the more sophisticated bartenders added sugar and bitters to whiskey, something we still do today. While there certainly was alot of dangerous liquor around, there were many upright and honest distillers feeding the American habit. What they produced, however, even though the best available at the time, was still a bit rough to take. The technology of the craft hadn’t yet achieved the smooth samples we can find today, so easing the burn of consumption required some softening ingredients, originally, sugar and bitters. At the time, the word “cocktail” referred only to this preparation. Base spirit, however, wasn’t always whiskey. Patrons at fancy bars, often hotel bars, could order a Brandy Cocktail and it would be brandy with sugar and bitters. But why leave that formula alone? At some point in the 1800s came a wave of “improved” cocktails. The Improved Whiskey Cocktail is one of these, and followed the pattern of taking the cocktail formula, and adding liqueur or other ingredients. 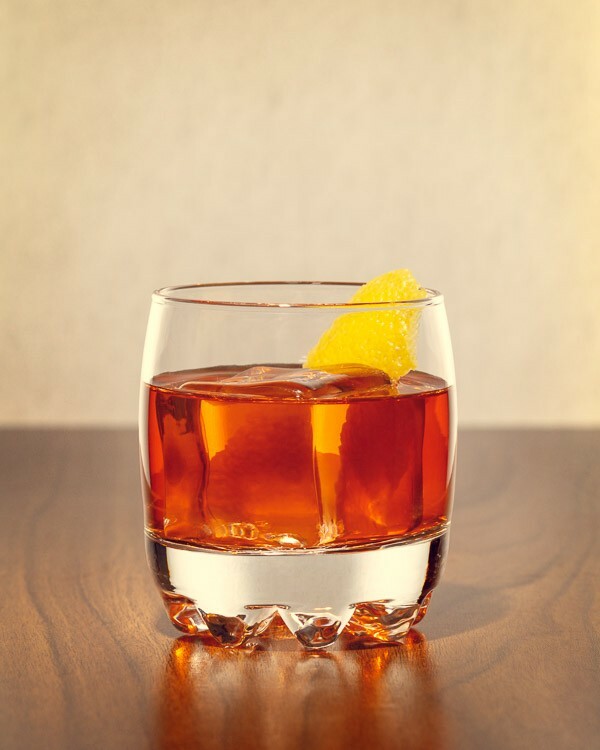 There are a few other classics from this time still served, such as the Improved Brandy Cocktail, and the very similar Sazerac. As improved cocktails became popular, and more widely known, some patrons preferred the original formula, and would order, “whiskey, the old fashioned way,” which is how the Old Fashioned got it’s name, and how “cocktail” came to describe a class of beverage rather than just one drink. Of course, we know the rest. Prohibition happened, then it went away and the distilling industry returned to form under new, and in some cases necessary, regulations, most of which are still relevant. Advances in technology improved the product, and whiskey became smoother, more complex, and, hyperbole aside, quite impressive. The refinement of the liquor didn’t dissuade those partial to cocktails, in fact, it made the cocktail itself much more pleasant. For it’s part, the Improved Whiskey Cocktail is also still relevant as one of the classic cocktails, and one of the oldest, and, one can only image, much better with quality spirits. Making an Improved Whiskey Cocktail is very similar to making an Old Fashioned, with the addition of maraschino liqueur, absinthe, and a few different kinds of bitters. Making an Improved Whiskey Cocktail is also very similar to making a Sazerac, with the exception of the maraschino. Our version, inspired by Death and Co., eschews the sugar as unnecessary. We make ours with bourbon, and it may be true that 19th century bourbon possibly required the help of sweetener, a quality bourbon, such as Bull Run Straight Bourbon Whiskey, doesn’t. We do, however, concede this is a personal preference, so if you like it sweeter, by all means, go ahead. It is historically accurate, after all. Dogwood Distilling provides us with Haint Absinthe, Luxardo Maraschino Liqueur is our cocktail choice, and Scrappy’s Bitters lends several bottles to the finished product. We like Scrappy’s Aromatic Bitters, and, in this case, we also dash Scrappy’s Orleans Bitters. The result is complex, intense, and inviting. If you’re looking for a step beyond an Old Fashioned, give the Improved Whiskey Cocktail a try, and appreciate just how far we’ve come with both our spirits, and how we enjoy them. Stir all ingredients with ice, then strain into a rocks glass over one large ice cube. Garnish with a lemon twist. Ever the storyteller, Tony M studied art and writing at Boise State University, and began his career as a freelance and creative writer. After spending time writing for various publications, and landing at a Portland based magazine, he moved to visual art and began a number of creative projects, including painting, drawing, and photography. But he never stopped being a storyteller, and today spends his time telling stories in creative conceptual images, creating product photography for local clients, and writing about booze.